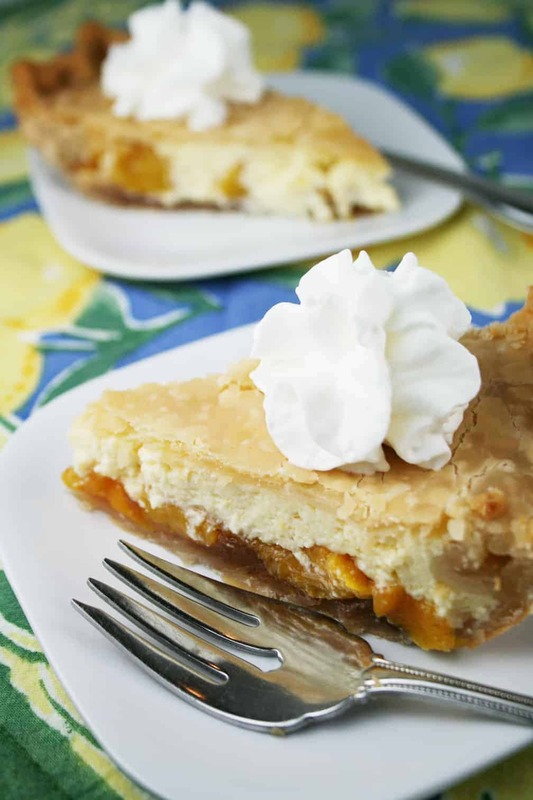 Peacheesy Pie won the 16th Pillsbury Bake-Off in 1964. Recipe on Pillsbury.com by Janis Risley, Melbourne, Florida. According to Wikipedia, Janis Boykin, 17 years old, won the contest, per Pillsbury 1965 cook booklet. I assume Risley is her married name. 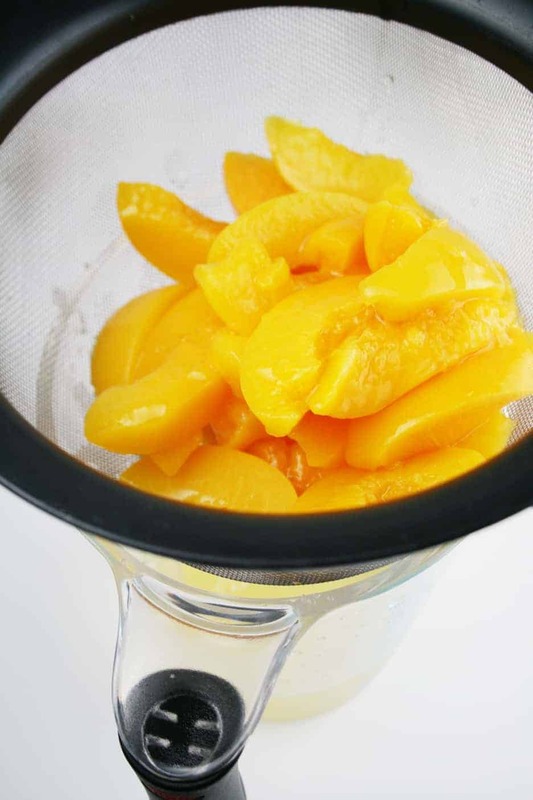 Start with canned peaches and drain, reserving the juice. Add sugar, cornstarch, pumpkin pie spice, vanilla and corn syrup. 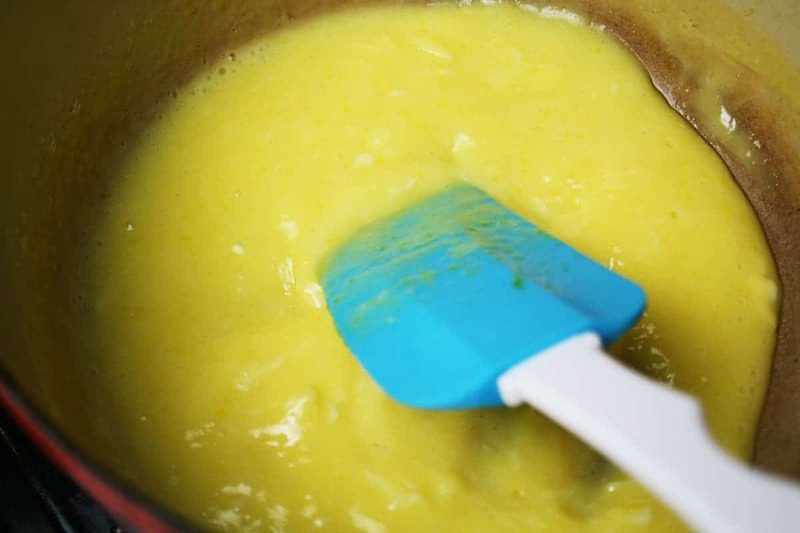 Then you make what is basically a lemon curd (sugar, lemon juice, a little peach juice and eggs heated to a boil, stirring constantly). Then you add sour cream and cream cheese to the lemon curd. Place one crust in a 9″ glass pie plate. 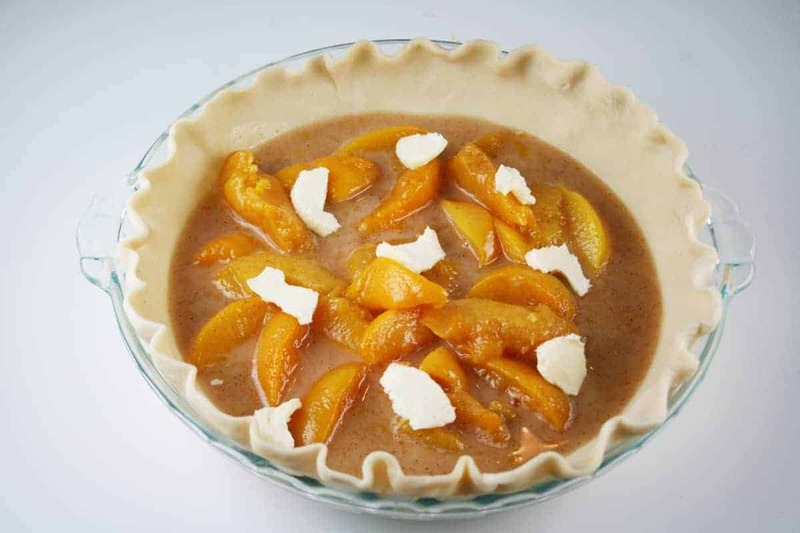 Pour in the peach filling and dot with butter. Top with the lemon curd and cheese mixture. That’s your “cheesy” part. 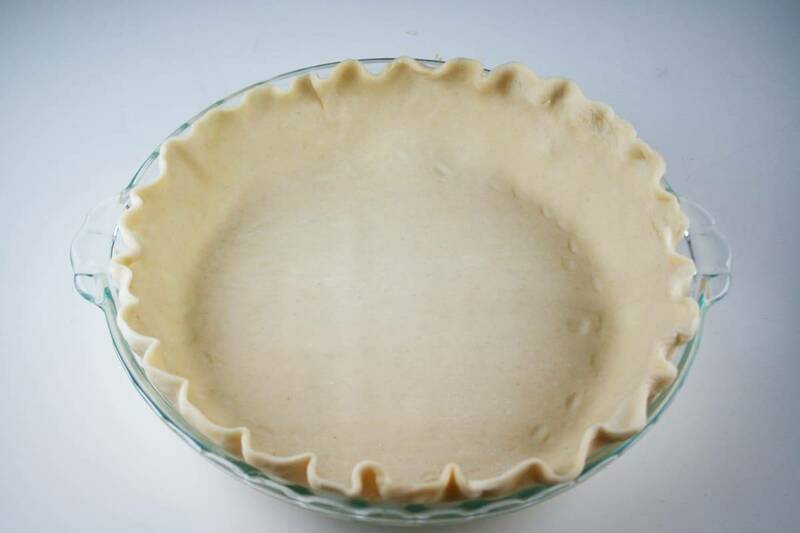 Place the second crust on top and crimp around the edges. I cut the top a little for venting. The recipe calls for cutting circles out of the dough and placing on top but I just decided to use the whole crust because I was in a hurry. Bake the pie for 10 minutes at 425°F. and then 35 to 40 minutes at 350°F. Let cool. Serve and enjoy. I think I would like it better without the pumpkin pie spice. But if you’re a big fan of the pumpkin pie spice, go for it! I also would prefer fresh peaches. Very creative recipe for a 17 year old! Stay tuned for Recipe #17 – Golden Gate Snack Bread. In medium bowl, mix all filling ingredients except peach liquid; set aside. 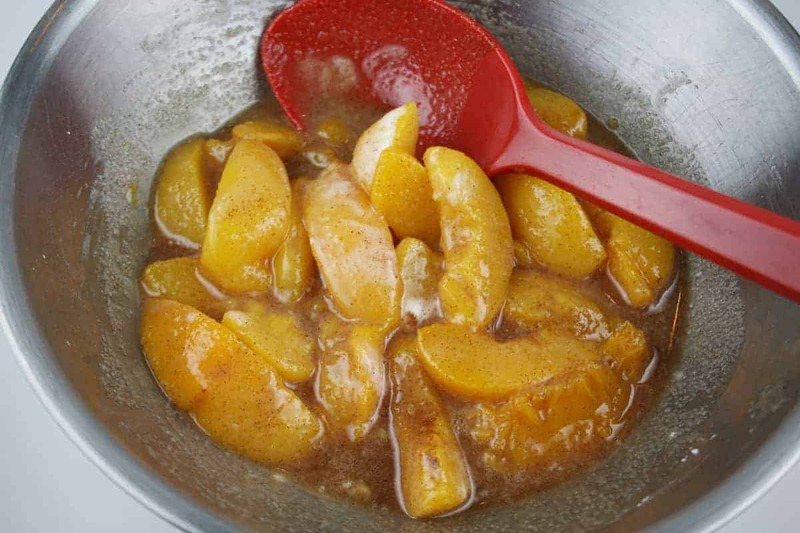 In 1-quart saucepan, mix 2 tablespoons of the reserved peach liquid, 1/3 cup sugar, the lemon juice and eggs. Cook over medium heat, stirring constantly, until mixture boils and thickens. Boil 1 minute, stirring constantly. Remove from heat. In small bowl with electric mixer, beat sour cream and cream cheese on medium speed until smooth. Gradually beat in hot egg mixture until well blended; set aside. Heat oven to 425°F. 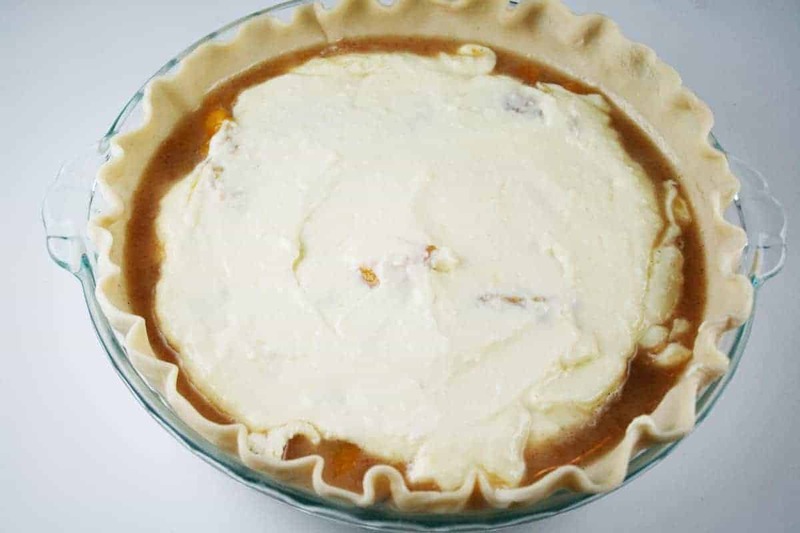 Place 1 pie crust in 9-inch glass pie pan as directed on box for One-Crust Filled Pie. Spoon filling into crust-lined pan. Dot with butter. Spoon topping mixture evenly over filling. 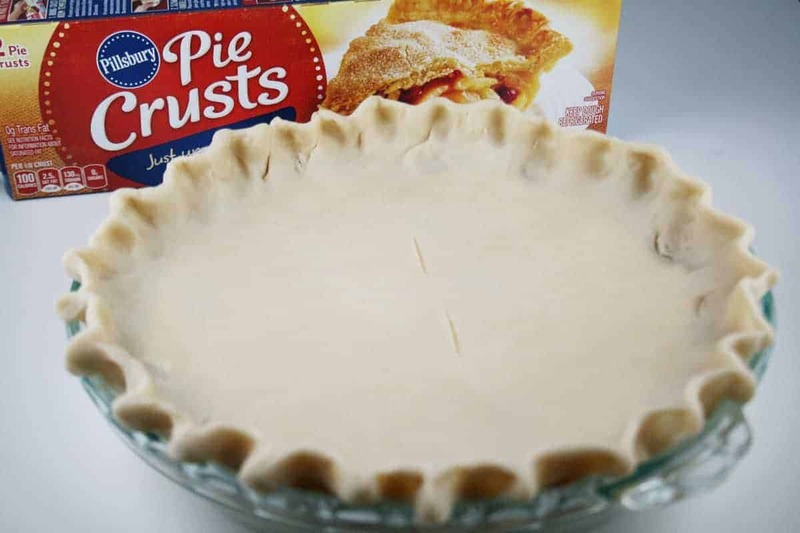 Remove second pie crust from pouch; place flat on work surface. With floured 3-inch round cutter, cut out 8 rounds from crust. Brush tops of rounds with remaining 1 tablespoon reserved peach liquid. 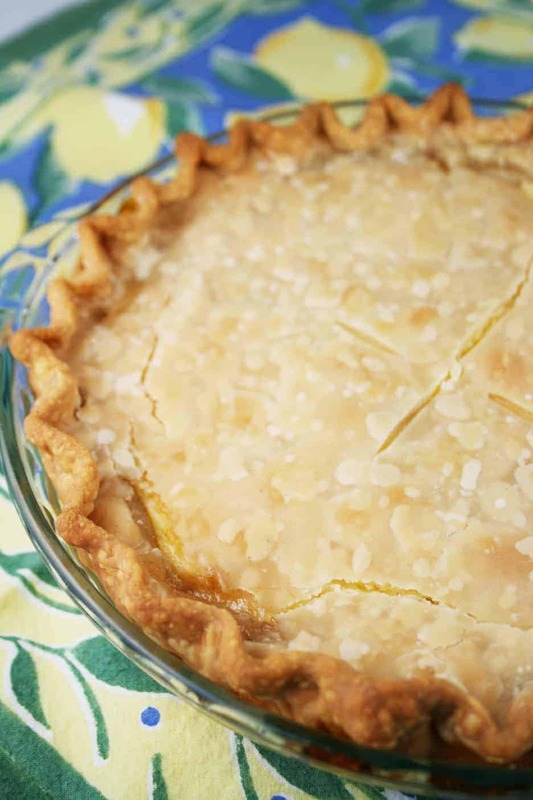 Arrange pie crust rounds over topping. Bake 10 minutes. 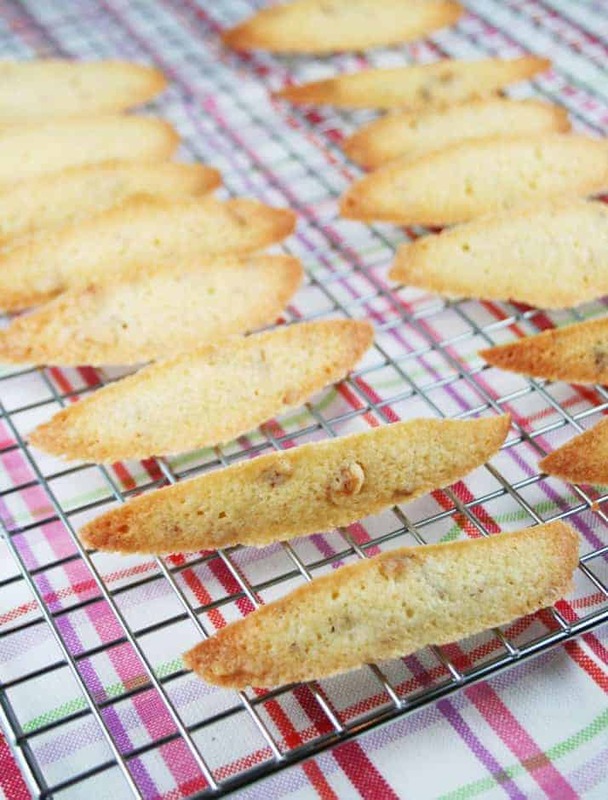 Reduce oven temperature to 350°F; bake 35 to 40 minutes longer or until crust is golden brown. After 15 to 20 minutes of baking, cover crust edge with strips of foil to prevent excessive browning. Cool completely, about 1 hour. Store in refrigerator.